("Belinda contro i mangiadischi" is the new album of this expert Italian beat combo (from Salerno, south Italy) "Tony Borlotti e i suoi Flauers" , born in 1995! 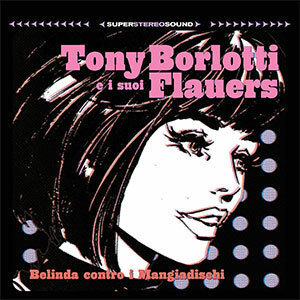 The current 'Beat Italiano' scene was suffering for today's lack of great bands like Tony Borlotti e i suoi Flauers. Whether you're Italian or live anywhere in the world we're sure you'll enjoy the freshness of these "fake young people" who live and play like they'd still live at the Piper Club's heyday! No other band round can mix the authentic Italian sixties Beat Garage (good fuzz) and pop feel like Tony Borlotti e i suoi Flauers ! "Belinda contro i mangiadischi" is the new album of this expert Italian beat combo (from Salerno, south Italy) "Tony Borlotti e i suoi Flauers" , born in 1995! So listen to this records ( 12 songs)...and then go and drive your Lambretta ! !